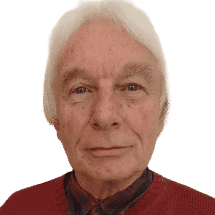 Home ・ Politics ・ Does the European Union generate external instability? Does the European Union generate external instability? The historic achievement of peace within a Europe of universal norms is belied by the external instability engendered by violent and incoherent interventions. The European Union is justly admired for making war among its members impossible. This is no small achievement in a continent which was in a state of semi-permanent warfare for the past two millennia. It is not only that we cannot even imagine the usual 19th and 20th century antagonists, such as France and Germany, going to war ever again. The same is true of other, lesser-known animosities which have led periodically to bloodlettings: between Poles and Germans, Hungarians and Romanians, Greeks and Bulgarians. Unthinkable is also the idea that the United Kingdom and Spain could end up, regarding Gibraltar, in a reprise of the Falklands/Malvinas war. But creating geopolitical stability internally has not, during the last two decades, been followed by external geopolitical stability along the fringes of the union. Most of the big EU member states (UK, Poland, Italy, Spain) participated, often eagerly, in Operation Iraqi Freedom, which led to the deaths of some half a million people, destabilised the middle east even further and produced Islamic State. Then, seemingly not having learned from this fiasco, France and Italy spearheaded another regime change, this time in Libya. It ended in anarchy, another civil war, two competing governments and a UN Security Council deadlocked for years to come—since it is clear that China and Russia will not in the foreseeable future vote to allow another western military intervention. Join our almost 30.000 subscribers! 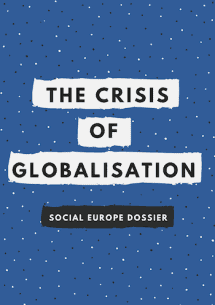 "Social Europe publishes thought-provoking articles on the big political and economic issues of our time analysed from a European viewpoint. Indispensable reading!" Thank you very much for your interest! Now please check your email to confirm your subscription. 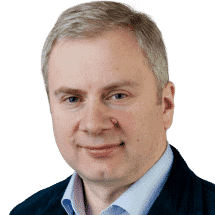 The next example of generating instability was Ukraine, where the then government of Viktor Yanukovych, having only postponed the signing of an EU agreement, was driven out of power in 2014 in a coup-like movement supported by the union. It is sure that a reasonable counterfactual, with the same EU-Ukraine agreements being signed and without a war in eastern Ukraine and with Crimea still part of Ukraine, would have been much preferable to the current situation, which threatens to precipitate a war of even much greater dimensions. Finally, consider Turkey, in an association agreement with the European Economic Community since 1963, and thus in a membership-awaiting antechamber for more than half a century. The initial period in power of Recep Tayyip Erdoğan was marked by pro-European policies, a desire to create an ‘Islamic democracy’, in the mould of the Christian democracies of Italy and Germany, and civilian control over the army. But realisation that, because of its size and probably because of its dominant religion, Turkey would never be recognised as part of Europe led Erdoğan, gradually, to move in an altogether different direction—with an almost zero chance that he would come back to his original pro-European stance. The endless waiting period, with similarly protracted negotiations over what are now 35 chapters which need to be agreed between candidate countries and all 28 (or soon 27) members, is what lies behind the frustration with the EU in the Balkans. Long gone are the days when Greece could become a member after a couple of months (if that) of negotiations and an agreement between the French president, Valéry Giscard d’Estaing, and the German chancellor, Helmut Schmidt. The European bluff—it neither has the stick nor the carrot—albeit long hidden behind the veil of negotiations, was recently called by the Kosovo leadership, when it engaged in a trade war with Serbia. 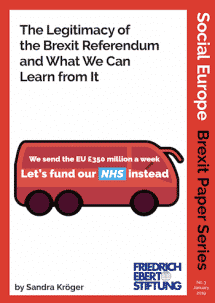 The EU could express its ‘regrets’ but it was squarely ignored. In the past, nether Kosovo nor any other Balkan state would have dared to defy Europe so openly. It all means that Europe needs a much better thought-out external policy with respect to its neighbours. There are already some signs that it is moving in that direction but it is doing so too slowly and hesitantly. A multilateral compact with Africa is needed to regulate migration from a continent with the fastest rising population and lowest incomes. 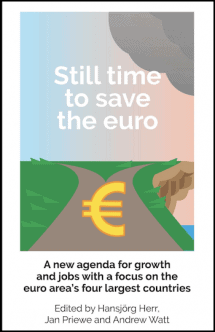 Much more European investment—in hard stuff, not conferences—is needed. Rather than complaining about China’s Belt and Road initiative, Europe should imitate it—and, if it desires to counteract Chinese political influence, invest its own money to make more African friends. A similar set of much more proactive policies is required within the framework of the Mediterranean initiative, while military options in the region should be forsworn no less clearly than they are within the union. When it comes to the potential members, as in the Balkans or the western republics of the former Soviet Union, interminable talks should be replaced by either special association with no expectation of EU membership or clearer, time-limited negotiations leading to membership. Both would manage expectations better and avoid the build-up of resentment and frustration. The most important challenge is the relationship with Turkey. The EU does not have a blueprint for a Turkey after Erdoğan; nor can it offer anything to the Turkish secular opposition, as it is not clear within itself whether it wants Turkey in or out. It should be rather obvious that a European Turkey, with its vast economic potential and influence in the middle east, would be a huge economic and strategic asset. Such a Turkey would also behave differently in Syria and in Anatolia, because it would have an incentive to follow European rules. This rethinking of the EU’s neighbourhood policy thus calls, in short, for three things: greater economic aid to Africa, no support for wars or regime change, and much clearer rules and time-limits for membership talks. Branko Milanovic is a Serbian-American economist. 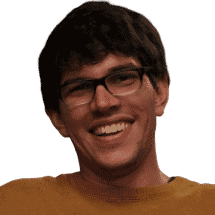 A development and inequality specialist, he is visiting presidential professor at the Graduate Center of City University of New York (CUNY) and an affiliated senior scholar at the Luxembourg Income Study (LIS). He was formerly lead economist in the World Bank's research department. 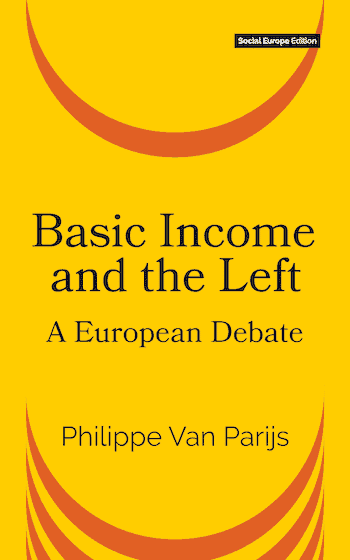 Is an unconditional basic income without means-test or work-test compatible with social justice and individual self-worth? Does it open up the space for an end to demeaning labour and a resurgence of voluntary work and cultural life? Is it affordable? 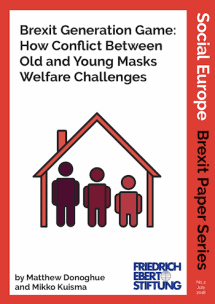 This collection of short but compelling essays, all previously published in Social Europe, allows both proponents and opponents to make their case and is designed to extend this vital discussion to a wider audience. Co-sponsored by the S&D through its Progressive Society Initiative, the Independent Annual Sustainable Economy Survey is an alternative vision of the Commission's Annual Growth Survey. 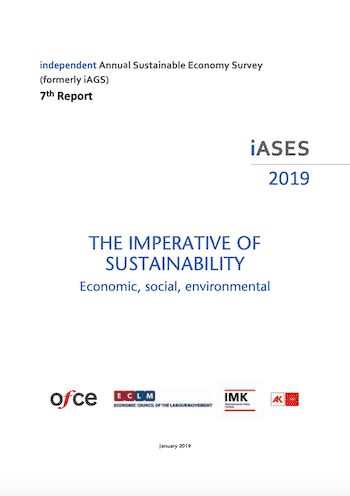 In addition to its usual in-depth analyses of economic and social developments in Europe, the new iASES broadens its scope and addresses environmental sustainability. To this end, it provides the first ever evaluation of Europe's ‘climate debt’, i.e. a computation of the investments needed for EU Member States to achieve the climate targets set out in the COP 21 agreement. Should digital labour platforms be treated as private employment agencies? This Foresight Brief examines whether digital labour platforms should be treated as private employment agencies. Platforms like LinkedIn may rightfully be perceived by the general public to be mere social networks, but underneath their sleek design, they also act as an employment service. This brief specifically focused on one of the central principles of international labour standards on employment services, namely that jobseekers must not be charged any fees or costs for job-finding services, unless those fees or costs have been approved by a competent authority. Zygmunt Bauman was a towering intellectual who saw and analysed – right up to his death in early 2017 – the great socio-political changes, often convulsive, in modern western society long before his peers. 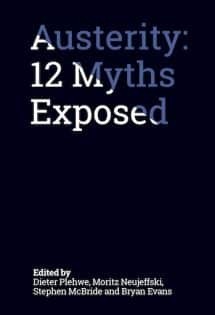 Here we highlight his prescient insights into what he dubbed ‘liquid modernity’ with 24 chapters on topics ranging from online loneliness via precarity/poverty/inequality to migration, fear of the ‘Other’ and the decline of the nation state. 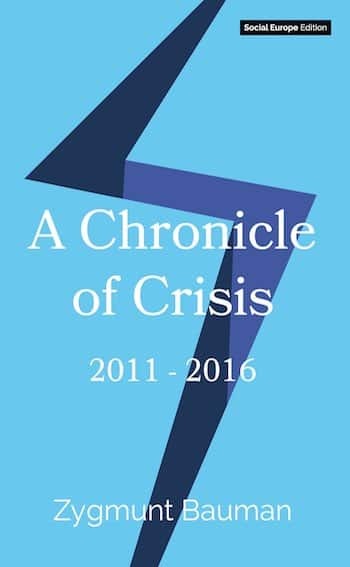 Chronicle of Crisis, 2011-16, written by one of the great chroniclers of our times, will be read and re-read for decades and more to come. 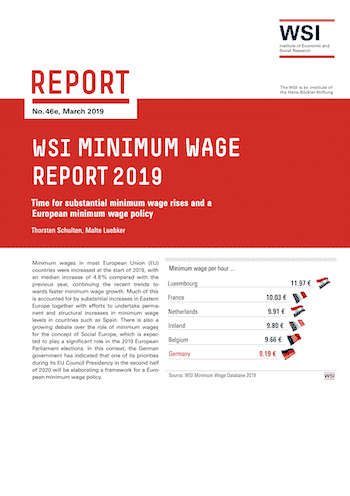 Minimum wages in most European Union (EU) countries were increased at the start of 2019, with an median increase of 4.8 % compared with the previous year, continuing the recent trends towards faster minimum wage growth. Much of this is accounted for by substantial increases in Eastern Europe together with efforts to undertake permanent and structural increases in minimum wage levels in countries such as Spain. There is also a growing debate over the role of minimum wages for the concept of Social Europe, which is expected to play a significant role in the 2019 European Parliament elections. In this context, the German government has indicated that one of its priorities during its EU Council Presidency in the second half of 2020 will be elaborating a framework for a European minimum wage policy. Manufacturing is set to be core to Europe’s future. More jobs will be created and growth will increase if certain economic and industrial changes are well managed over the coming years. 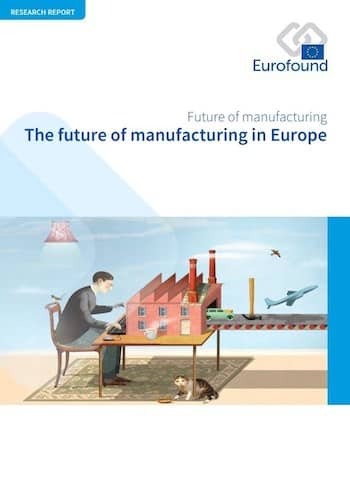 The main findings from the explorative project on the Future of manufacturing in Europe reveal that early adoption of emerging, game-changing technologies will give Europe a decisive competitive advantage and Europe will benefit more than other trading blocs from full implementation of the Paris Climate Agreement in terms of growth and jobs.